On December 10th, 2014, the Chicago South loop area opened the Fred Anderson Dog Park. It’s a large park divided into two separate areas: a smaller section for smaller dogs, and a larger area for larger dogs. According to the South Loop Dog Park Action Cooperative, who worked diligently to get the park open, the small-dog area comprises 5,200 square feet (0.12 acre). The large-dog area is 13,700 square feet (0.31 acre). Many people in the neighborhood, including me, had anxiously awaited the grand opening. The cold Chicago weather could not keep us out of the park once its door were opened. Finally, our inner-city neighborhood had a nice, safe space for our dogs to enjoy; a new forum for playing, running, and having fun! And then, within a couple of weeks, people were already complaining about their dogs’ behavior in the park. My dog is pulling me to the park, my dog won’t come when called in the park, my dog was barking at other dogs on the other side of the fence, my dog is too excited and gets into trouble when we go to the park. Is it possible our only real moment of connection with our dogs during that time is when we call them to leave the park? Here are some alternatives to the most common mistakes and behavioral problems I see in dog parks. It’s no surprise dogs pull their owners to get to the dog park, since they see being in the park as a higher value than the process of getting there. When walking to the park, both the owner and the dog have one thing in mind: getting to the dog park. Rarely do we take the time to enjoy the walk there by connecting with our dogs through training exercises. The most value should be between both ends of the leash—not the dog park. If your dog is pulling you to the park, divide your walk into smaller target goals. For example, your first goal might be to reach the lobby without your dog pulling, followed by reaching the middle of the sidewalk, then the end of the block, and so on. Bring small treats (a cut-up hot dog or a stick of string cheese can work well), so you can reward for the dog staying with you. Once you reach the first goal, have your dog sit or call his name to get his attention, then spend a few seconds rewarding a couple of good behaviors before continuing to the next goal. If you usually give yourself 40 minutes to go to the park, include the walk as part of that time so you do not get discouraged or rush. Trust me, these exercises will tire the dog just as much or even more than running wild in the park—and you’ll be building your partnership and increasing your own value in the dog’s eyes. It takes more energy to keep it together when excited than to just give into arousal. Once you reach the park, spend some time walking parallel to the park. Perhaps bring a toy to play some tug. I know what you’re thinking: “Why am I doing all the work?” Trust me. This will make the time in the actual park more pleasant for everyone. If your dog is too excited to even focus while walking near the park, a good alternative is to step on the leash (keep holding the end of it for security). Wait for your dog to settle and decide on his own to offer eye contact before rewarding. Continue to reward every look until the dog is more attentive to you than he is to the dogs in the park. It might seem like forever, but it won’t be. Have patience. Once your dog is more attentive, let’s say 10 minutes into it, you can let him inside the park. Giving the dog a chance to rehearse impulse control by voluntarily choosing to look at you and focus (rather than trying to force him to do it, or getting upset at him for not doing it quickly enough) will allow him to balance himself more and lower his arousal level. Entering the park in a calmer, more balanced state will help your dog have fun, avoid fights, and listen to you when you ask him to do something. Always have your dog enter the enclosed dog park off leash, usually dog parks have two doors leading to the park, you can take the leash off in between the doors when its safe. Having the leash on can increase arousal, make your dog feel trap and increase the chances of aggression. However, entering the dog park calm, balance and with the leash off can increase the chances of a better welcoming. Many people like to keep an eye on their dog by placing themselves in the middle of the park or somewhere with the most visibility. While this is a great thing to do, I love to give some of the responsibility to my dogs, as well. When you stay in place, your dog’s responsibility to check in becomes boringly simple for her. In addition, some dogs will stay around the same area as the owner, preventing the dogs from truly taking advantage of the space the park provides. I recommend that owners circle the park and move around while still checking in on the dog. Dogs have great peripheral vision and will follow your movement. In fact, one of the things dogs see best is movement at a distance. This will help spread the energy level of all the dogs present throughout the length of the park, and will encourage the dogs to keep an eye on their owners, making it easier for you to get your dog’s attention when needed. Spreading the energy around the entire space can decrease arousal and lower the risk for rough play getting out of hand. I don’t suggest bringing treats in the park (it can cause too many problems, especially in a group of dogs you don’t know and can’t predict), but I do like to make leaving the park reinforcing. Once again, if all the value for the dog is inside the park, it makes no sense to him that he would want to come to you and then head straight home. However, if you follow the exit with more fun outside the off-leash area, then coming to you will predict more fun versus the end of the fun. After leaving the off-leash area, take some time to sit on a bench and reward your dog, even if all you can do is lavish him with adoring attention. Play with a toy, practice your training drills for class, or end your time out with a small, calm training game. Allowing yourself to connect with your dog before going home will not only increase your value but allow the dog to cool off and bring his energy fully back into balance. By doing so, you will prevent crazy Fido running circles around your apartment and jumping on your furniture when you arrive home. He will be a happier, calmer, more balanced tired, instead of an overstimulated tired. 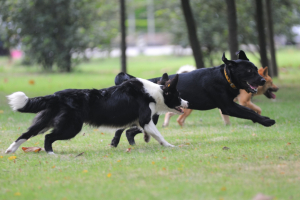 By playing these games and investing time in these exercise, you are strengthening your working relationship with your dog as well as practicing distraction work. Remember that training is usually learned in a class or with a trainer, but it is lived in all the daily tasks that you do with your dog. Taking a trip to the dog park is just one of many such moments. If your dog loves other dogs, there is no better opportunity to practice your training when dogs are visible. So, the next time you head to the dog park, bring some yummy treats for the walk there and a toy to play with afterwards, and get your training game on !